THE day is finally here!!! Presenting Chitralahari to overseas by Sarigama Cinemas. Supreme hero Sai Tej, Nivetha Pethuraj, Kalyani Priyadarshan and Sunil starrer Chitralahari. 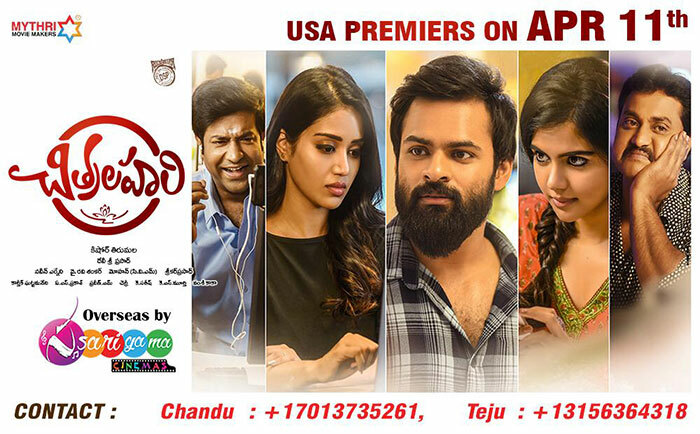 The premiers are scheduled on 11th of April 2019.The movie will have the biggest ever USA release for Sai Tej. Chitralahari is directed by Kishore Tirumala, who has directed the most charming movie 'Nenu Sailaja'. Sensational music composer Devi Sri Prasad’s BGM is a big asset to this movie. Not to forget this movie’s tracklist is on a repeat mode. click here for USA schedules.